Do mopping, dusting, sweeping, and lint-removing jobs with pads made for Nellie’s WOW cordless electric mop. 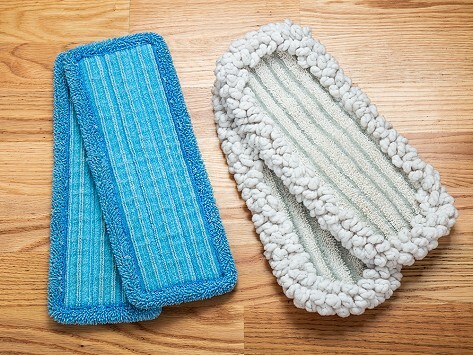 The reusable microfiber cloths make clean-ups easier, and can go through the washing machine about 100 times. Dimensions: 6" x 2" x 14"
Great no getting hands dirty wringing out wet mops! This cordless electric mop from Nellie’s stood out to us for many reasons—first because it comes from a renowned name in green cleaning, and then because we saw its fast, oscillating cleaning action. The WOW Mop is powered by a high-frequency motor that makes it easy to use. The lightweight design is simple to maneuver, too, thanks to a jointed, extra-long handle. There are even LED headlights to help you spot dirt under furniture and in dark corners. The included reusable microfiber wet cleaning cloths can go through the washing machine and last for about 100 uses. There are dry pads for dusting and lint-removing jobs, and Nellie’s makes it own eco-friendly cleaning solution, too. Nellie’s is named after founder James Roberts’ mom, who embraced green cleaning before it was even called that. We appreciate his commitment to being eco-friendly and how this slim mop does dirty clean-up jobs for you.